I have been making smoothies nearly every day for about seven years. Longer than both my children have been alive. So, I have been able to get into the habit and perfect the process and know the recipes. They also got a taste for them before they were born. These days those kids are bigger and have opinions of their own, but I still believe in the green smoothie as one of the best ways to get my children a lot of nutrition (even though they always come away from drinking smoothies with a big green mustache). So here is what we do to get our kids to eat their smoothies. 1. Model It. 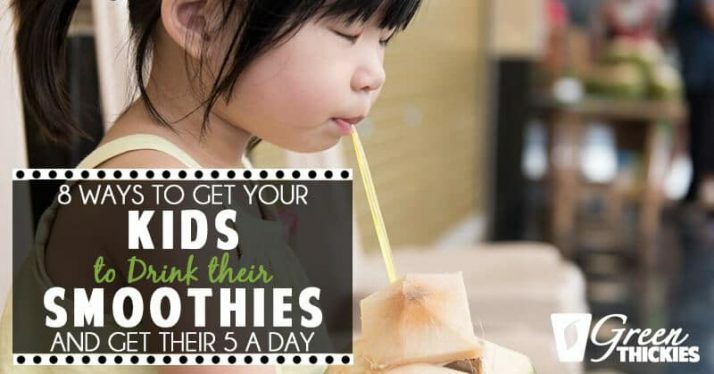 Let’s not forget the most basic step in getting kids to eat smoothies, is to eat your smoothie in front of them as regularly as possible and enjoy doing it. Talk about what is in the smoothie and how much you like it. As the most important people in your child’s life, you have a lot of opportunity to guide your children without ever saying a word. 2. Make it part of our routine. Every weekday morning, as part of their breakfast, they are greeted in the morning with a green smoothie. They have come to expect it. In fact, the blender does not even wake them up in the morning any more. It just is. 3. Be flexible on when they eat it. So, just because I serve in the morning does not mean they eat it in the morning. My son, who is in school all day long, will eat it as part of his breakfast. I tell him it is part of the nutrition he needs to get his day started. My daughter who is home by lunch, has the option to eat with lunch or a snack later on in the day. Now that it is summer, both of them will have the option of “later” but no later than lunch. 4. Involve them in making it. If they are up, they can help choose what goes into the smoothie: spinach or romaine, strawberries and mango or berries and peaches. I don’t care, but then they get some input and an opportunity to help me make it. Kids always love helping out with cooking. 6. Ask them to invent their own recipes. Now, you can coach them and guide them if you have a lot of experience in making smoothies. Or you can sit down and search for a recipe online together that you both might want to try. Either way, this is another way to get your kids involved. 7. Name it. 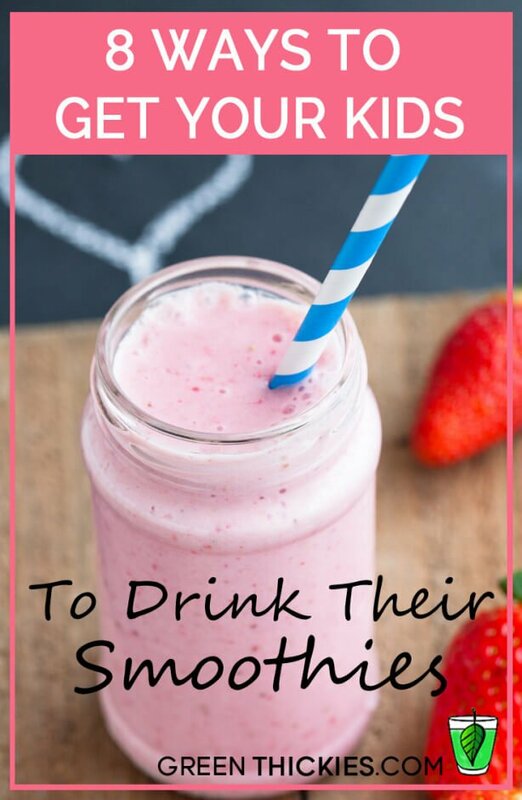 As you are working through your own inventions and creations, old and new, every day is a new day and you ask your kids to name the smoothie they are drinking on that particular day. They could name the smoothie as they are making new recipes as well. So this is the deal. Make them often and model drinking them. The best thing is for smoothies to just be natural part of your diet, your life and and your routine. Kids like to feel included and part of the family. So when you are drinking from the ‘same pitcher” you are accomplishing that. For those of you that are just getting started out, use fruit your children like and start out with greens like spinach and romaine. These have more mild flavor and are easier for your kids to tolerate if they are not already used to eating green food. Then, at other times in the day serve your kids more vegetables and salads. It is important for them to get real used to eating all kinds of vegetables. Smoothies is a great start to this lifelong habit of healthy living. Lisa Reinhardt is a certified parent coach at TheParentJourney.net and a green smoothie enthusiast at Green-Smoothie-Recipes.net. She transforms families through a holistic approach.